Cake Tasting for your occasion couldn't be any simpler or sweeter! I love tastings. It’s so much fun to try something new and different and, of course, tasty! And there is no better way to get an idea of what a baker has to offer from their cakes then eating some. I usually only have a cake tasting in conjunction with a wedding cake consultation. Recently though I have had many requests for doing them separately due to wedding couples schedules, travelling from out of town, or doing consultations over the phone and Skype, I needed to develop an alternative and more efficient option. What will be inside? No peeking! With that all out of the way….. I now present the Tiny Bake Shop Tasting Box! It is a lovely assortment of four currently popular cake flavors, four fillings, and four frostings. It’s a great way to mix and match some flavors and to get your taste buds thinking. All the cake samples are frosted minimally with Tiny Bake Shop’s standard Vanilla Buttercream to allow you to focus on the cake flavor. Delicious cakes, fillings, and frostings all for you to try. 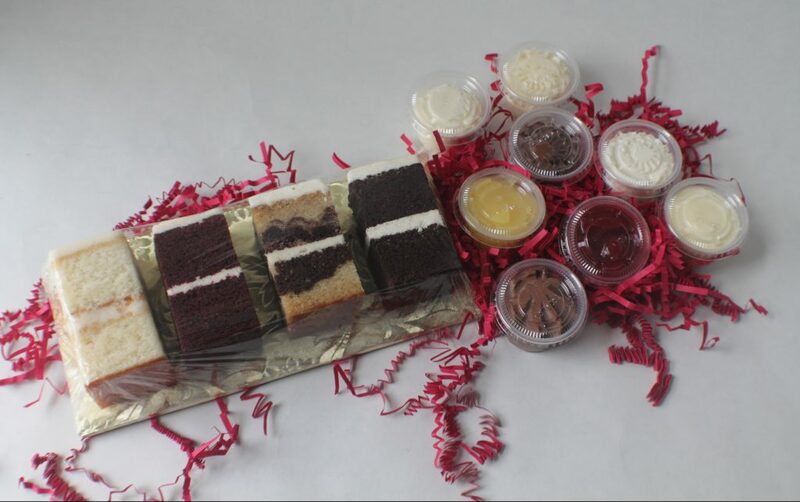 I also want to offer these cake tasting boxes to anyone! If you’re curious about some of the flavors Tiny Bake Shop offers this is a perfect opportunity to sample a few, find a favorite, or order your custom-flavor cake in full confidence. You can find additional information about Cake Tastings on Our Menu and in the FAQ. If you’d like to place an order for your own cake tasting box, just head over to the Contact page and give me a call or send a message. 1. Have a meal prior to tasting. Sampling cakes when you are hungry can influence your decisions. 2. Sample each cake, filling, and frosting separately. This allows you to really taste individual flavors. 3. Mix and match to find your favorite combinations! 4. Take a few notes to help you remember what you did and didn’t like as well as any other thoughts on flavor, texture, taste, etc. 5. Drink water during your tasting. It helps to cleanse the palate. Save the coffee for later. Okay. Okay. Now for the extra fun part! How can you win one of these delicious tasting boxes? First, decide which of the two groups you fall into — “Previous Customer” or “Not Yet a Customer” — and then follow the instructions below for how to enter. No purchase is necessary. Write a comment on this blog post below (be sure to identify yourself). Write a comment on this blog post below telling me why you want to win a tasting box (be sure to identify yourself). Like this post on my Facebook page and then Share to your personal page. The giveaway will end on Sunday, August 6, 2017 at 11:59 pm. Two winners will be chosen randomly, one from each group, and will be notified on Monday, August 7, 2017. Get your entries in before the end date and you could win some deliciousness! Ooh this sounds yummy!! What a great idea! Thanks, Bethany! I think it is, too. This is a terribly timed temptation when I’m trying to get back in shape 😜… but a cheat meal never hurt, right? Have tried many different flavors of your cupcakes and love them all! Continue to tell everyone about your business. Even when one of the receptions at work asked for any ideas for a bakery. So glad you enjoyed them! The cream cheese icing is hard to beat. Hi, Megan! Glad you’re hearing great things! Send me an email; I’d love to talk with you about your wedding.